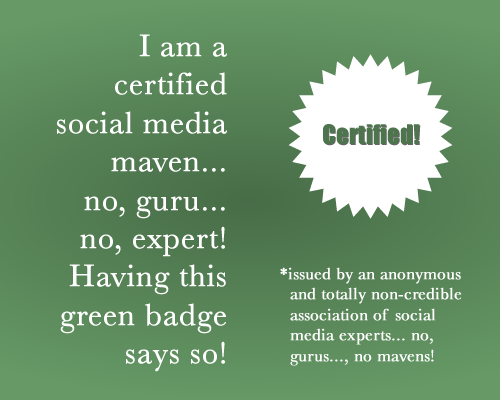 Social Status: Looking for a Guru? I Tweet and I am on Facebook and I have a blog while assisting with and advising clients and helping them wade through social media. I say wade through because for someone who is starting on social media, the reality is that it can and does add an hour more of work a day and that is if you are doing social media properly. For me, properly means the same as how you use and access your emails. In the mornings (I am assuming) you check your emails to deal with anything that is needed to do for the day as well as enquiries, priorities, plans, meetings and you respond accordingly. On average, business and companies (from CEO to any level of staff) access their emails at least every 20 - 25 minutes. I am assuming that the busier you are at work, the bigger your business is, the more products and services you provide and they way you service your clients, probably means that you email and receive emails all day long. So soon, social media (new media) will become just as important and vital for those people who are providing their business with social media services. As well as checking emails, I recommend checking whichever social media sites you are active on, to respond to any comments, or queries or messages or even likes on Facebook, Twitter, your blog and LinkedIn. In a company which offers a service (such as mine) you are responsible for providing services. In my case it's tips, suggestions, helpful hints and references to apps which can help you business and my Twitter account, has proved an invaluable tool for finding, sharing and using information to benefit my clients. There are always recommendations regarding social media and one is knowing where your audience is. I have a Facebook business page where I link this blog and my Tweets (links, updates, shared content) but the reality is I use Facebook as a search tool to find and drive content regarding social media practices so I can ensure that I am knowledgeable and essentially helping my clients by providing a better service. Jess Nichols who wrote a blog post about knowing your product and that if people search for you (if you are calling yourself a social media expert/guru), they need to see that you are using social media actively. Jess responded to on Twitter when we were discussing this post " I try not to put too much pressure on my blogging; I'd rather now do quality > quantity. Once a month is ok for me" She also emphasises that she thinks "It comes back to being authentic and legitimate in the industry"
If you sell products and have daily weekly or monthly events, you will have to be active on the social media accounts where your audience, your buyers are coming from. By active I mean anything that needs to responded to (whether positive/negative) needs to be actioned within 24 hours. Over the past few months, I have to agree with Jess's post. It is about quality and being human and authentic when you are providing a social media service. Sure some people (or people who are doing their social media) schedule their blog posts and activate their links via platforms which help them drive their links over a certain period of time. If your buyers are in the UK and USA and are reading your blogs and buying your products, while you are asleep, there certainly needs to be an awareness and implementation of best practices for your business. I realise that people who are at work doing the work that they do, always say that they have no time for social media. I am not honestly a fan of people who call themselves social media gurus/experts. Social Media is still new media there are hundreds and thousands of people still who have not embraced Facebook, Twitter, Blogger, YouTube, LinkedIn and hundreds of other tools and platforms that can drive their message, their business online. So Google your company/business. What comes up? More importantly what doesn't come up? A charity event you put together and advertised everywhere on print? A new line? A list of events/courses. A recent interview? A podcast or video that you spent time and money on? The answer is that social media will ensure that all of this, comes up - links, sharing, events lists, Facebook, Twitter, LinkedIn, SMO, SEO, labels, tags will provide you with ways to further market and drive your business alongside traditional marketing techniques. I recommend being active on social media and driving traffic. Yet I also recommend being part of a community, providing valuable content and getting to know your audience and what people get and want from your business. I work alongside businesses to ensure that we put practices into place which are suitable for their needs and I concentrate on one important aspect - community. I am not a marketing manager. I am not a guru. I need to put my recommendations into practice more and ensuring I do and represent what I teach. I discovered that I love this industry, this ability to reach people globally and I saw the benefits of this new media and how we can all put this into our practices at work. But like Jess points out in her blog post, are they active, or lurking or aggregating? Are they embracing tools and social media sites themselves? When was their last Facebook, Twitter update and their latest blog post? Regardless of whether you are a small business or a giant corporation who has a social media team, I recommend doing. I don't recommend feeling pressure to do and adding additional work to your already jam packed work day. I do not recommend doing at the cost of other things which are a priority at work. If you can hire someone to manage your social media holistically by embracing and sharing and engaging, try that for a few months and then Google your business again. And if you cannot, (don't have the time) or if you feel that you should hire someone with the knowledge to do so, check how and what they are doing first online, Google the person, read what they link to, blog about, tweet about and share - and look closely at when and how they do so. And then by all means Google me and Google the word guru.